Teaches: Refuse to Be A Victim® courses and instructor training, NRA instructor training, Women's Pistol, basic courses, Beyond the Basics, AT I, IA, II, IV and others. Developed lesson plans for AT courses with Karl Rehn, designed Women's Pistol course. NRA Certifications: Training Counselor, Chief Range Safety Officer, Instructor in Home Firearm Safety, Pistol, Rifle, Shotgun, Personal Protection, Muzzleloading Pistol/Rifle/Shotgun, Metallic Cartridge and Shotshell Reloading. Refuse To Be A Victim® Instructor and Instructor Trainer. Other Certifications: Texas Concealed Handgun License Instructor, National Range Officers Institute (NROI) Level I Range Officer. Memberships: NRA (Life), Texas State Rifle Association (Life), US Practical Shooting Association, Steel Challenge Shooting Association, Single Action Shooting Society, many area gun clubs. Training: Firearms courses from Thunder Ranch, InSights Training (Greg Hamilton), Jerry Miculek, Kay Clark-Miculek, Wendell Joost and others. Tactics, combatives and martial arts training from InSights Training, Tactical Defense Institute (John Benner), Tom Gohring and others. Texas Concealed Handgun License holder. Experience/Achievements:She has competed in both DCM rifle and IPSC pistol disciplines, winning trophies in both areas, including class wins at 1998 Space City Challenge, Make A Wish Classic, and Coors/Taurus Paper and Iron Championship. 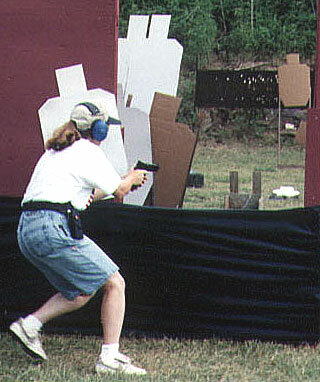 She competed in multiple USPSA area championships in 1996 and 1997. She also served on the Education Committee of the Texas Concealed Handgun Instructor Association in 1997. In 1998 she attended the Level I CQPC course from Tactical Defense Institute and taught Defensive Living, Basic Pistol, CHL, and Advanced Training courses for KR Training. In 1999 she attended the InSights Training Street and Vehicle Tactics Course and placed 10th in the Women's division at the USPSA Limited Nationals. Recent: In 2000 she completed the InSights Defensive Knife and Intensive Handgun courses, and trained with IPSC and Steel Challenge women's champion Kay Clark-Miculek. She also attended a clinic taught by Rob Leatham, Brian Enos and Henning Wallgren, and earned her NRA Shotgun instructor and Shotgun Training Counselor ratings, and was Top Woman at the 2000 Texas State Steel Challenge championship. In 2001 she attended the Jerry Miculek revolver clinic, the competition pistol course taught by Kay Clark Miculek, and placed in the top 5 women at the Steel Challenge. She was also promoted to instructor trainer for the NRA Refuse To Be A Victim® program. In 2002 she was once again in the top 5 women at Steel Challenge, and competed in many major tournaments including the USPSA Open Nationals. She also attended the InSights Wilderness First Aid course. In 2003 she attended the InSights Unarmed Self Defense course, and was 4th woman at the 2003 Steel Challenge. In 2004 she was 4th overall at the S&W LadySmith match, was in the top 5 women at the 2004 Steel Challenge and was top B Openl at the Area 4 Steel Championship. In 2005 she attended the 2 day advanced competition pistol course with U.S. Army team shooters (and IPSC Grand Masters) Max Michel, Jr and Travis Tomasie. In 2006 she attended a 1-day Steel Challenge clinic with Max Michel. Starting in 2013 she was an assistant coach of the Texas A&M Corps of Cadets Marksmanship Unit. In 2015 she completed the MAG-20 course with Massad Ayoob. Personal: Penny also has a PhD in molecular genetics. Her "day job" includes a faculty appointment at a large university. She has also worked on a DoD funded program on bioeffects of nonlethal weapons. Her photography and writing been published in Front Sight, S.W.A.T., Women and Guns, and other journals.